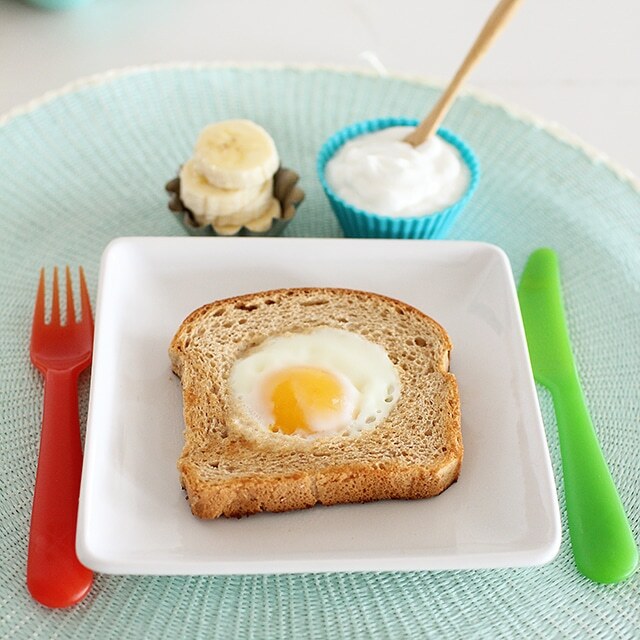 Start your kids’ morning off with healthy protein and hearty whole grain toast with a fast, fun Egg in a Basket. 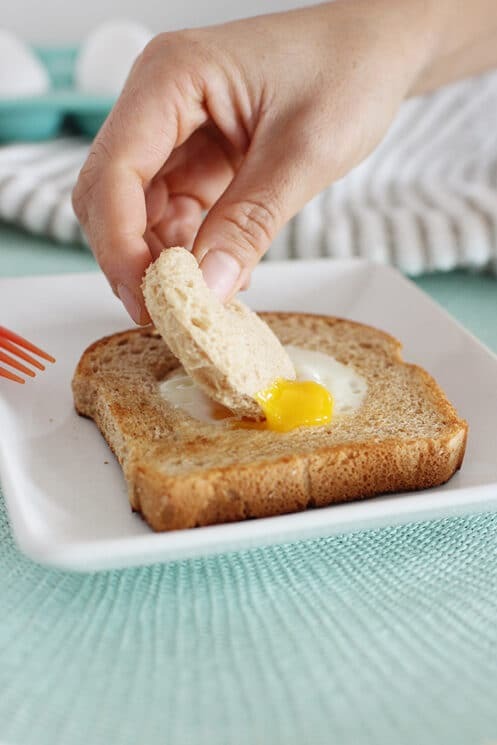 Just like everybody needs good take-along breakfast ideas, everybody needs a handful of healthy, high-protein breakfast ideas in their wheelhouse. 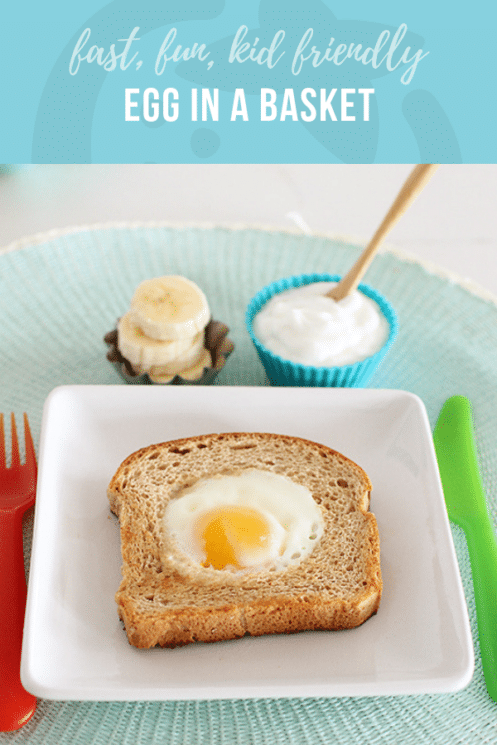 An Egg in the Basket is a cute, quick, and balanced recipe that gets your kids out the door on time with good food in their bellies. 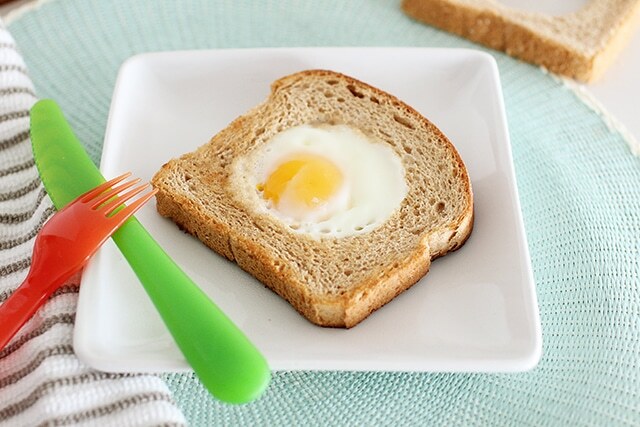 If you’ve got three ingredients, a pan, and a drinking glass, you can make an Egg in the Basket in five minutes flat. 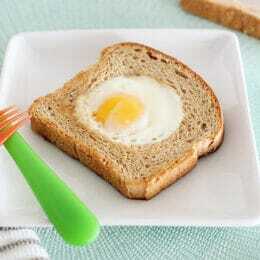 Crack the egg directly into the hole in the bread, and let it sizzle. At this point you have a choice. 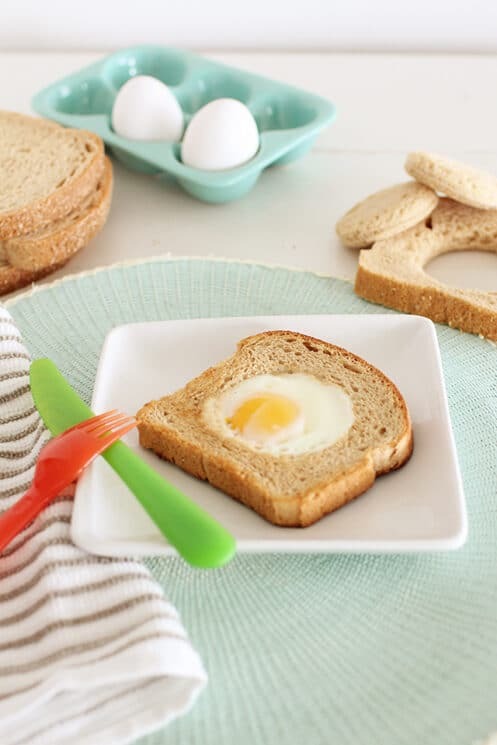 You can continue to cook the Egg in the Basket until the whites have set and the yolk is still runny (like a sunny-side up egg) or you can gently flip the bread and egg to cook both sides of the egg. A note about food safety when cooking for kids: around 1 in 20,000 raw eggs contains salmonella bacteria. It’s a very low number, but you still may not be comfortable serving runny eggs to your kids. That’s OK! Just flip that puppy. 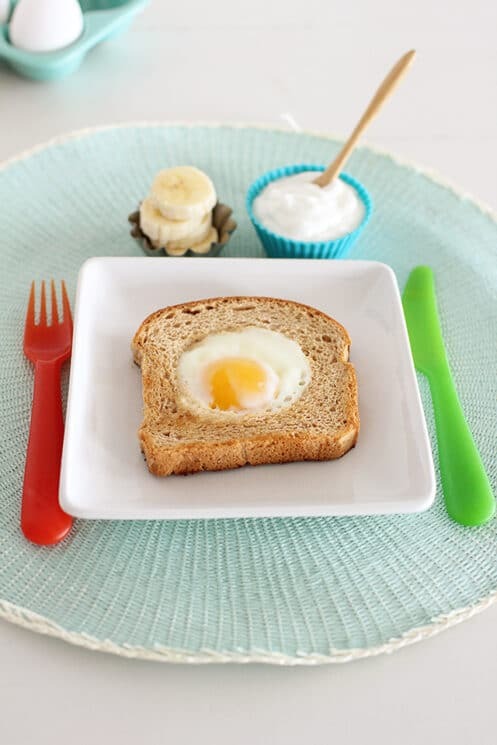 If your kids like a runny egg now and then, go ahead and slide it onto the plate without flipping, and dip your extra toast into that gooey goodness. Maybe you’ve got a kid who makes a “yucky” face at eggs. Some just do. But this recipe could help change their mind and their taste buds. It’s got a playful look, a fun name, and a taste and texture that’s different from ordinary eggs, scrambled or fried. Yes, it can be hard to take the plunge and offer your kids something they openly dislike. But remember that kids’ only chance to like new foods comes from exposure. So even if you’re not sure whether or not your kids will love it, try it anyway! Serve up an Egg in the Basket this week and let us in on their reactions in the comments. Using a drinking glass, cut a hole out of the center of the bread slices. Place the butter in a large skillet and heat over medium until the butter begins to foam. Place bread slices into skillet, however many will fit. Break open an egg into each hole in the slices. Cook for 3-4 minutes or until the egg whites have fully set. Carefully remove from skillet with a large spatula. Continue until all have been cooked. Cook the remaining bread circles in hot skillet to toast up and use for dipping. I like the one eyed monster! We call them egg in the holes. .. yours is a lot cuter. That’s funny. I’d be curious to hear what other names people have out there for this. Maybe all 5 people that read this blog can weigh in if they have a different one?!?!? Six people. Just found your website and love it. Funny, I’m in Highland and when I googled peanut butter balls I got your website. Sorry we have to vote for Lone Peak. I will be making the peanut butter balls and granola bars and chicken soup. We call our one eyed monsters, Sunshine Eggs because it looks like the sun in the morning. Ahhh, we’re neighbors! Thanks for reading the blog. Sunshine eggs is a great name! I am so excited about this site and wish I had found it sooner! I never stop looking for healthy meals for my family. Thank you for all the wonderful recipes, this is such a find for me! I am going to tell people! We call our bird nests. I’ve heard them called eggs in a basket. What heat and how long do you cook these? Do you flip them? I’ve made them before and always flip them and it’s a terrible mess. I know I’m doing something wrong. I’ve done both. They are prettier when you don’t flip them, but they cook faster if you do. I usually use medium heat, and once the whites of the egg are totally white, I flip. My family has always called these “Submarine Sandwiches.” Love them. Especially cooked in a good quality grass-fed butter with jam smeared on top.